While waiting for a friend who was running late, I started doing something I haven’t done in a very long time. Not since childhood, when we all enjoy leisure & patience. Tired of waiting in the living room I decided to soak up the sun in my balcony. 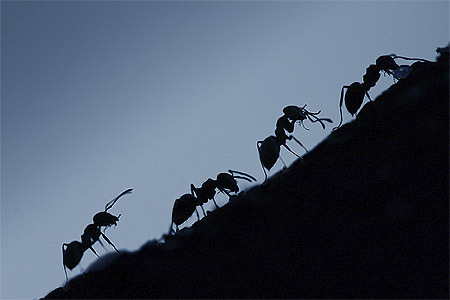 As I sat down on the arm chair, my feet resting by the balcony railing, I noticed a file of ants marching on the wall. They were careful enough to avoid me, though at the time my intention was just to observe. I started following the file. It originated from the area next to the kitchen sink that had recently received a pesticide treatment. This could’ve been the reason for their relocation. The file went over the washing machine, then to the window, then to the side of the railing and disappeared below the apartment wall. With nothing better to do, I decided to disturb this carefully chosen route. I blocked the washing machine route with an old newspaper. They soon corrected their course & started going over my juvenile obstruction. I would have to be more creative, I thought. So I tried this, on both their routes - balcony railing & the washing machine. It worked! The Ants were confused. But my excitement was short lived. I soon realized what I assumed as confusion was just the ants strategizing their next move. They settled for an alternate route, across the window by the washing machine and then connecting back to the file on railing. “They are really smart!”, I thought. I tried to get more creative by bringing in my nephew’s plaster cast, washing powder, using a magnifying glass to focus sunlight on their route, even charming them to this trap with some sugar & flour. Nothing worked. They always found an alternative route that led them to their final destination. After trying several of my so called creative obstacles, I accepted my defeat and started pondering over my effort of last half an hour. I realized that I was no match for the Ants. They were more resourceful than me. I had put a dozen obstacles in their way, some creative ones like focusing light from the magnifying glass; but their tenacity & resourcefulness always won. They tackled all these problems head on, without fear. Did they feel desperate and powerless? Did they overcome each of these obstacles? Did they finally achieve their objective? Because they used their small head & never gave up. So many times, we feel lonely, desperate, powerless & fragile; mostly due to our self created obstacles - even though we consider ourselves smarter and more evolved than ants. As my friend finally arrived, I left with the realization that we are not like ants & that’s very sad. I also decided that I must try to be more like them when facing obstacles in life. The resourceful ants taught me that no matter how bad a situation seems, there is always a way out; we just need to use our small head & never give up. NOTE - No ants were harmed during this little self realization experiment. The only thing that was harmed was my ego. he he.. nice one and true indeed!